In this tutorial, you’ll learn how to create a more laid-back kind of game: the classic board game. 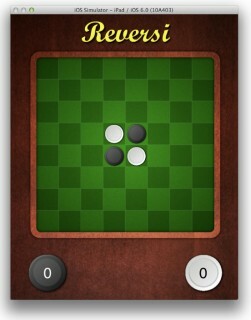 Specifically, you will create the time-honoured classic Reversi for the iPad, using plain UIKit. Learn how to make a board game for iOS! Previous gaming tutorials on this site have looked at creating beat ‘em up games, platformer games, or space shooter games – but some of us like to take life at a more relaxed pace! 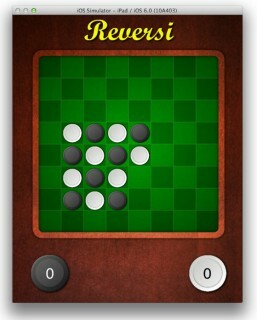 Reversi is a turn-based game played on an 8×8 board. Two players, represented by black and white pieces, take turns placing their pieces on the board. By surrounding one of your opponent’s pieces with pieces of your own color, you flip, or capture, your opponent’s piece. The winner is the player with most squares covered at the end of the game. So shall we play a game? Let’s dive into the tutorial and get started right away! This game uses a number of graphical assets which are included in a starter project. Download the starter project here. The starter project is an iOS Single View Application, iPad only, with ARC and unit tests enabled. In order to give you a quick head start, there are already a few controls in the SHCViewController nib file with corresponding outlets. The project also includes an interesting little utility class, SHCMulticastDelegate — but more on this later. What would a board game be without a board? You’ll add a class to the project that represents the playing board. This class will represent an 8×8 playing board. Each square can either be empty, occupied by a black piece, or occupied by a white piece. To keep track of the state of each square, you should use an enumeration. Along with making your code easier to follow, an enumeration allows Xcode to assist you with things such as code completion and type checking. ‘BoardCellState’ is now a type of its own – just like NSInteger or CGFloat. So this helps you save time and avoid mistakes as well. The interface for the playing board has three methods: one for getting the state of a cell, one for setting the state, and one more to clear the state of all cells on the board at once. The code above implements each of your board interface methods. The clearBoard method makes use of the C memset function to set each byte of the block of memory occupied by this array to zero. This way, you will be sure that your array is initialized to a known state of all zeros. You may notice that old C-style arrays are being used to store the state of each board cell. The Cocoa framework supports 1-dimensional arrays with NSArray, but has no support for 2D arrays, so you’ll be rocking it old-school with the C-style arrays. However, the issue with using old C-style arrays is that there is no automatic bounds-checking performed when reading or writing to the array. You can quite happily set the state of a cell at “column = 34, row = 45” and write to some random piece of memory. Uh oh! NSArray performs automatic bounds checking and throws a NSRangeException if an out-of-bounds access occurs. But since you’re using C-style arrays, adding some custom bounds checking to the _board array is a must-have for your app. How else can you tell that the bounds checking is working? Unit tests to the rescue! Unit tests are a set of scenarios that exercise small pieces of your code (known as the ‘units’). In Xcode, the set of unit tests is set up as a separate target. This means some bits of code can be shared between the app and the tests, and other bits of code are just standalone tests and won’t affect the app. Sad dog image courtesy of lampelina. To add your first unit test, select the SHCReversiGameTests folder, and add a file using the iOS\Cocoa Touch\Objective-C test case class template. Name the class SHCBoardTest. The generated source files will already have the imports required for running tests. The first test test_setCellState_setWithValidCoords_cellStateIsChanged checks that when the value of a cell is ‘set’, the same value is returned when you ‘get’ the cell value. The second test test_setCellState_setWithInvalidCoords_exceptionWasThrown checks that an exception is thrown if you try to set a cell that is outside of the bounds of the board. Note: If you are wondering about the odd method names, they follow the popular convention defined by Ray Osherove – [UnitOfWork_StateUnderTest_ExpectedBehavior]. You might be thinking, “Why on earth did I just write and run a test that I knew would fail?” That’s a good question! This is the development principle known as test-first. By writing the test and observing that it fails, you are confirming that your test is actually working properly and adding value — essentially, you are “testing” the test. Since your test showed that accessing the C array will not throw an out-of-bounds exception, you can now update the class to put the bounds-checking code in place. This adds some bounds checking to the getters and setters to avoid accessing invalid memory. Re-run the unit tests (keyboard shortcut ⌘U), and with the bounds checking above in place, you should find that your tests pass. Great! It’s a good idea to get into the habit of thinking up and coding tests as you work on your application’s logic. Your challenge — should you choose to accept it — is to come up with more unit tests for your code as you follow along with the tutorial. Now, back to the gameplay logic. Now that you have a class representing the state of each square, you’ll create a class to hold the rest of the game state, such as the score for each side. Highlight the ‘Model’ group in the project and create a new file using the iOS\Cocoa Touch\Objective-C class template. Name this new class SHCReversiBoard and make it a subclass of SHCBoard. 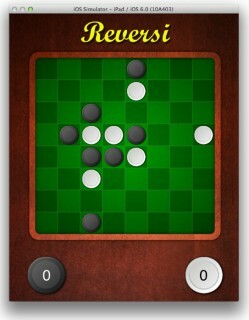 The above code sets the initial starting point of a game of Reversi: two black playing pieces and two white, occupying the centre four squares of the board. Would you like to practice your unit testing skills? 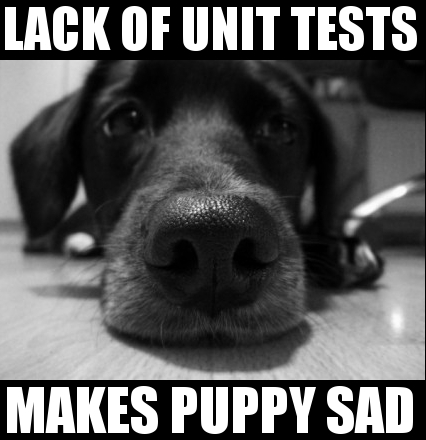 Try adding a unit test for the above method! Now that the board is set to its initial state, you’ll need to create a View so that the players can see the gameboard on screen. 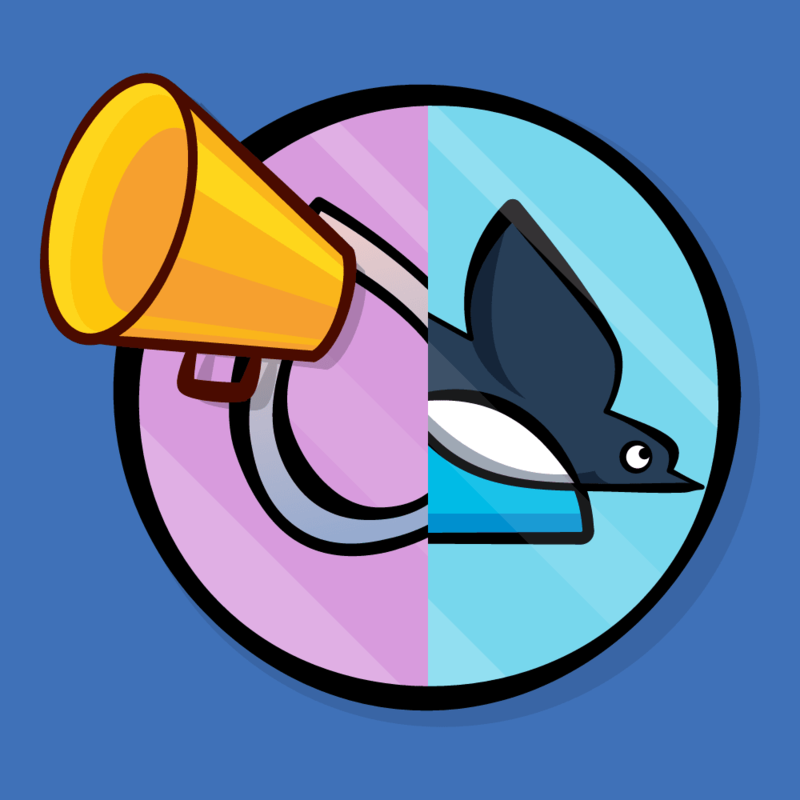 The starter app has a background image for the entire playing field. However, you need to create a view to place on top of each board square, that will contain the appropriate image for that square (white piece, black piece, or empty). To do this, highlight the ‘View’ group in the project and create a new file with the iOS\Cocoa Touch\Objective-C class template. 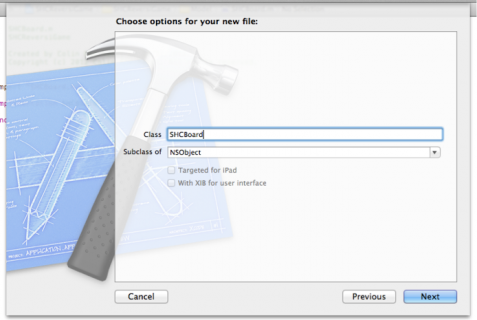 Name the class SHCBoardSquare and make it a subclass of UIView. Each square will be initialized with its row and column position, and each square will also know which board it belongs to. Later on in the tutorial, you’ll be using multiple boards to implement computer opponents — but for now just leave the declaration as-is so that you don’t need to rework everything later on. The initWithFrame:column:row:board: method stores the various arguments that are passed to it as instance variables. It also creates two UIImageView instances: one to display a black playing piece and the other to display a white playing piece. The update method shows or hides the black or white images depending on the state of the cell that it represents. 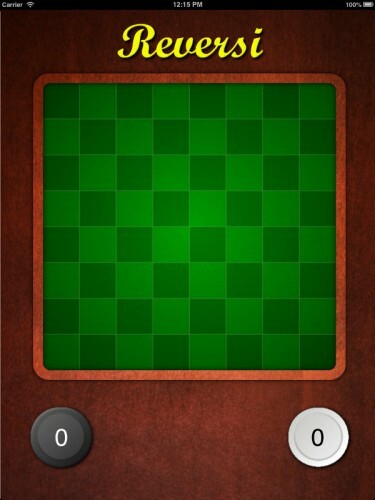 If there is no playing piece in the square, both image views are hidden. Okay, so that takes care of a single cell on the board. The next section shows you how to arrange these single cells into a full gameboard! In order to render the board, you’ll need 8×8 or 64 instances of SHCBoardSquare properly positioned on screen. To keep things organized, you will set up another view that will hold the 64 squares. Highlight the ‘View’ group in the project and create a new file with the iOS\Cocoa Touch\Objective-C class template. Name the class SHCReversiBoardView and make it a subclass of UIView. In the code above, the rowHeight and columnWidth sizes are first calculated. You'll hold on to these values to set the size and positioning of the 64 squares on the board. Next up is a double for loop to set up the 8x8 grid. For each turn of the inner loop, a new instance of SHCBoardSquare is allocated and positioned. Now that the view is set up, it's time to glue everything together to create the Reversi Board and View within the application’s view controller! Here you create your game board model class, as well as the view for the model. The CGRect used as the frame for the SHCReversiBoardView has been carefully measured to align with the PNG image that is the background for this application. Cool - your app is starting to look like a real game now! Well, a pretty board is fun to look at, but your prospetcive players will be itching to put some pieces on the board. Fortunately, the next section lets you do just that. Currently each of the 64 SHCBoardSquare instances is associated with a specific row and column, and sets its initial state accordingly. You will expand this concept to allow the SHCBoard to notify the individual views of state changes. 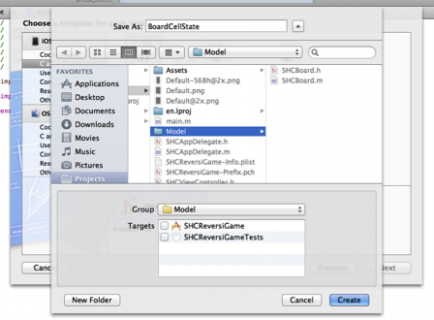 Highlight the ‘Model’ group in the project and create a new file with the iOS\Cocoa Touch\Objective-C protocol template and name it SHCBoardDelegate. This delegate can be used to notify the view when the state of a cell changes. This mimics the delegate pattern used by many of the Apple UI controls. However, there is a small problem with this. Your class exposes a delegate property that conforms to the above protocol, but this only allows for a single observer. However, you have 64 cells who are all interested in state changes. What to do? Fortunately I came up with a a simple solution> to this problem a little while back, by designing a class that allows you to multicast to multiple delegates. The class is called SHCMulticastDelegate - the one I mentioned earlier in this tutorial. The starter project includes this class for you. 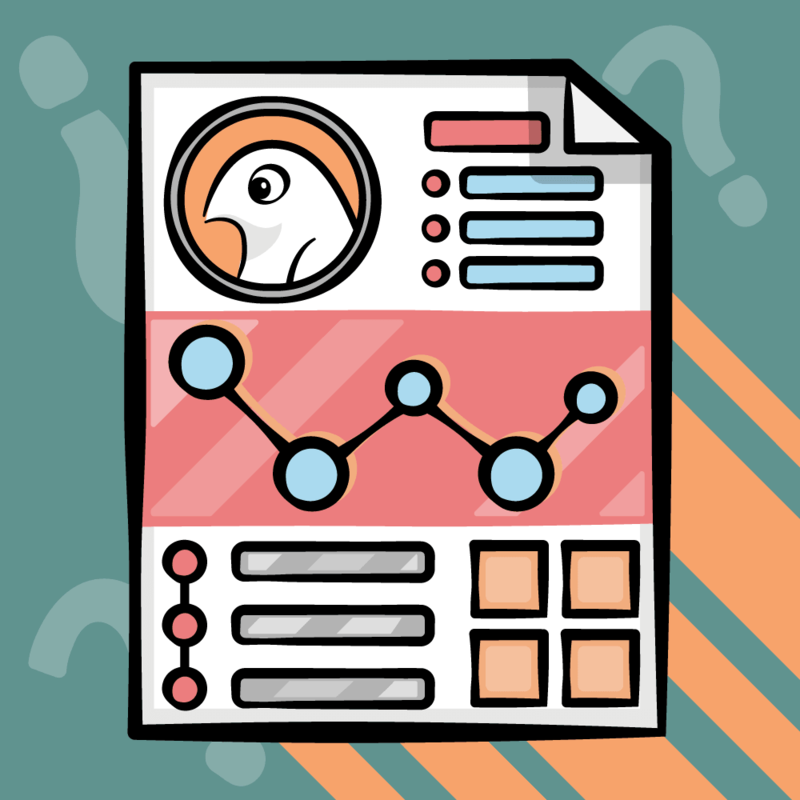 If you want to find out more about how this class works, and why it is useful, check out this post. // multicasts changes in cell state. Each delegate is informed of changes in state of individual cells. The reason that the multicast delegate is being assigned to an instance variable that conforms to the SHCBoardDelegate property is because the multicasting implementation is entirely generic – which allows it to multicast delegates which are defined by any protocol. In the code above, the multicast delegate is used just like a regular delegate. 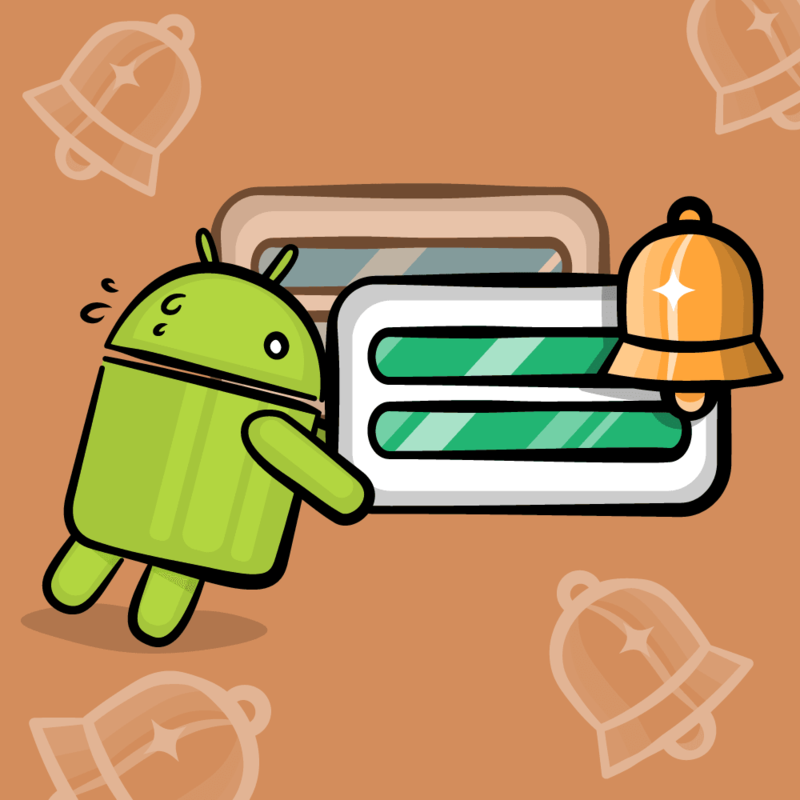 First, you need to check whether it responds to the given selector, and then send the message. Note: the clearBoard call uses a ‘special’ row and column coordinate of (-1, -1), which is used to indicate that every cell has changed, rather than sending 64 separate notifications. Now that you're sending messages to the delegate, it's time to add the code that will react to the cellStateChanged:forColumn:andRow: message. The above code checks whether the _column and _row instance variables match the coordinates of the cell that has been updated. If so, the square updates its visual state. Again, the ‘special’ (-1,-1) coordinate updates all squares. This ensures that when each square is created, it is added to the multi-casting delegate; in this manner, all 64 squares will be informed of state changes. With this code in place, any change to the board state will be immediately reflected in the UI. This will come in handy very shortly. You've done a fair bit of coding, but there's a bit more to do before you can build and run. Time to break out those code ninja skills and add some game logic! One of the main functions of the class SHCReversiBoard is to enforce the rules of the game. 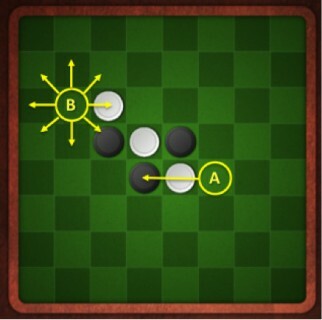 The above methods and properties will ensure that the players take turns, and are only able to place their playing pieces at valid locations on the board. Otherwise, total anarchy would result, and no one wants that! A valid move can be made on any empty square, so the check performed in isValidMoveToColumn:andRow: is fairly straightforward and uncomplicated. When a player makes a move, the setCellState:forColumn:andRow method is called using the multicasting delegate notification as described previously. Finally, the nextMove property is updated so that the other player may take a turn. Note that nextMove was set up as a read-only property, so you can update it by accessing the backing instance variable _nextMove directly. It feels like a long time since you've been able to build and run your app, doesn't it? Hang tight — there's just one more thing to implement: the handling of the tap gesture on the board. The code above adds a tap gesture recognizer, which results in the cellTapped method being invoked. This checks whether a move is valid, and if so, makes the move. The SHCReversiBoard class keeps track of whose turn it is. The game is starting to take shape. 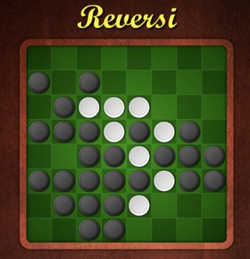 But there's something not quite right about it, which you will instantly recognize if you have played Reversi before. The game just lets you place pieces wherever you like, which is contrary to the rules of the game. In Reversi, when a piece is played, it must surround one or more of your opponent's pieces either horizontally, vertically or diagonally. The position marked ‘A’ on the board is a valid move, because it would surround a white piece to the left. However, ‘B’ is not a valid move as it would not surround any white pieces in any direction. So in order to determine whether a move is valid or not, you need to check for surrounded pieces in eight different directions. This sounds like a lot of work! However, the logic applied for all eight directions is exactly the same: one or more pieces must be surrounded. You can use this commonality to come up with a concise way of checking if a move is valid. // A 'navigation' function. This takes the given row / column values and navigates in one of the 8 possible directions across the playing board. The above code typedefs a block, BoardNavigationFunction, which takes as its arguments pointers to two integers. It is then followed by eight blocks, each of which de-reference the two arguments and either increment or decrement them. It looks a little strange, to be sure, but you'll soon see what this is all about. The above code creates an array of these navigation functions, adding each of the eight blocks defined earlier. In order to put all those blocks to use, you now need to implement the logic that checks whether placing your piece on a specific board square would surround some of the opponent's playing pieces. This method determines whether a move to a specific location on the board would surround one or more of the opponent’s pieces. This method uses the supplied navigationFunction to move from one cell to the next. Notice that because the row and column are integers, which are passed by value, the ampersand (&) operator is used to pass a pointer to the integer, allowing its value to be changed by the navigation block. Within the while loop, the required conditions are checked: the neighbouring cell must be occupied by a piece of the opposing colour, and following cells can be either the opposing colour (in which case the while loop continues), or the player’s colour – which means that a group has been surrounded. Note: Do you want some more practice with unit testing? The moveSurroundsCountersForColumn method is an excellent opportunity to practice your unit test skills to ensure that you have full branch coverage! The above code uses the array of navigation functions to check each in turn to see if any of the opponent’s pieces are surrounded. Note that this method has been split into two parts – one which has a state argument, and the other that uses the nextMove property. You'll see the reason for this shortly. However, the game is still a little dull – and since you haven't yet implemented all of the rules yet, every game will result in a draw. 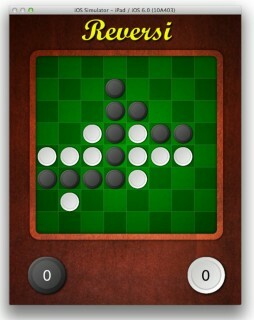 One of the key features of the game of Reversi is that any pieces that are surrounded by pieces of the opposite color are ‘flipped’ to the opposite color. It's time to put this rule into action! // are any pieces surrounded in this direction? The above method shows just how useful those navigation functions are; after checking whether any pieces will be surrounded in the given direction, a short do-while loop goes about the business of flipping the opponent's pieces. This uses the array of navigation functions to flip pieces in all eight surrounding squares. Congratulations — you've now implemented all of the gameplay functions to play a basic game of Reversi! Here is an example project of all the code you have developed in this tutorial so far. Until next time, why not look at implementing a different board game, such as Go? You will find that many of the techniques that you have employed throughout this tutorial will work well for a whole range of other games. I look forward to seeing what you will create! In the meantime, if you have any questions or comments, please join the forum discussion below.